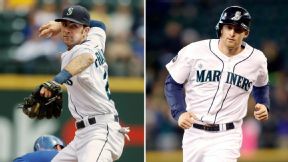 The Mariners have two capable shortstops: Nick Franklin and Brad Miller. PORT ST. LUCIE, Fla. -- A Mets insider acknowledged validity to an ESPNNewYork.com report about a potential match for the Mets in Seattle infielder Nick Franklin. The source said there had been dialogue with Mariners officials as far back as the winter meetings. The talk is expected to pick up in the next month with Seattle having an excess infielder and the Mets having the type of young pitching Seattle desires to obtain in a swap. The Mets likely would need to further debate whether they feel Franklin can handle full-time shortstop before pulling the trigger on any such deal. Whether the Mets would part with a prospect the caliber of, say, Rafael Montero also remains to be seen. Franklin, who turns 23 on March 2, hit .225 with 12 homers, 45 RBIs and six steals in 369 at-bats as a rookie last season while appearing in 96 games at second base and three games at shortstop. He now has been dislodged from second base in Seattle with the signing of Robinson Cano. And the Mariners already have a capable shortstop with Brad Miller. Franklin has considerably more career minor-league appearances at shortstop (261) than second base (122).